Todays Question: Why do people kill? We’ll be exploring the topic of murder – more specifically spree killings. Joining us is Dr. Robert King of University College Cork. Rob’s controversial work uses evolutionary and anthropological perspectives to examine the ultimate motivations behind human violence and sexual behaviour. In a wide ranging discussion we examine the status protecting evolutionary motivations behind ‘spree killings’ by ‘spare males’. Rob’s work has identified two separate populations of spree killers, older men who have ‘failed’ in keeping their families together and younger socially isolated men. We also discuss Hybristophiles – the women who fall in love with killers, including spree killers like James Holmes. Other topics touched on include the headhunters of Borneo, Mira Hindley’s nazi fixation, Margaret Mede, the Shankill Butchers, lynchings, and ‘non violent’ tribal cultures, ‘an heroes’, and Gregory Stanton’s 8 Stages of Genocide. Do we live in a particularly violent time? Have spree killings really increased? Or were they underreported in the past? Do media depictions increase the amount of spree killings? How does psychopathy interact with wealth and power from Gengis Kahn to Wallstreet traders? How has the concept of psychopathy evolved – from Cleckley’s the Mask of Sanity to Hares Psychopathy Checklist to the DSM definition of anti-social personality disorder, to John Ronson’s Psychopath Test? This is a review written back when I was studying psychoanalysis. These articles critiquing psychodynamic texts proved pretty popular (I’m assuming with students, or practicing psychoanalysts) when I initially posted them. Having recently uncovered a couple that had never made their way to the web, I thought why not release them. Hope you find them useful / interesting, despite the rather dense academese. 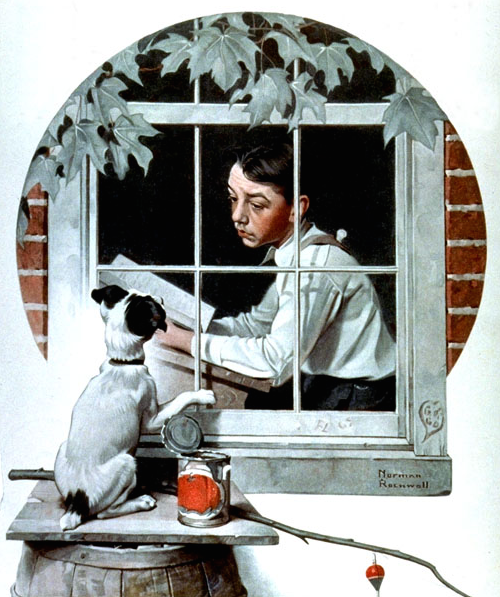 Stuck Inside, by Norman Rockwell. Inside lives (Waddell, 2002) attempts a phenomenological object relations account of psychological development, from infancy to advanced age. Margot Waddell considers the stages of life as states or meta-positions (Waddel, 2002, pp 8), contingent and dependent on earlier developmental negotiation, rather than inevitable developmental milestones. These states represent individuated matrixes of attitude and biological development, in which the positions articulated by Klien and others shift in the context of emotional and intellectual development, external stressors and interpersonal relations. The book examines the impact of biological changes, family of origin, adolescent affiliation, adult individuation and finally the difficulties of coping with degeneration and impending mortality.